In case you’re unfamiliar with the 1966 movie The Russians Are Coming!, it’s a fun romp about a Russian submarine that accidentally runs aground off the New England coast during the Cold War and the local residents who panic and think they’re being invaded. I remember laughing a lot as a kid at some of the antics. But it’s no laughing matter what Russia is doing to the US today. 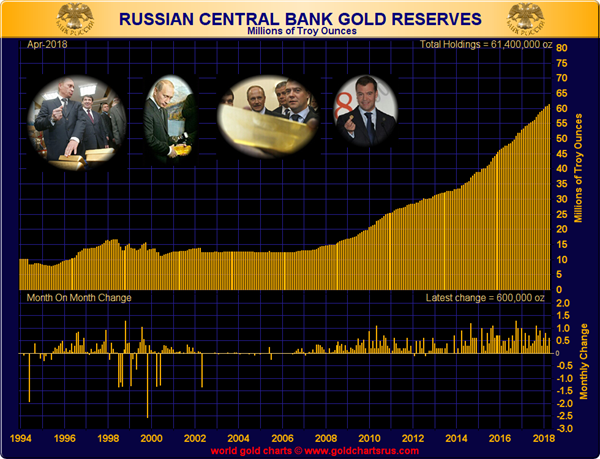 Most gold investors know that Russia has been accumulating gold at a rapid pace since the financial crisis in 2008. But now they’re suddenly dumping US Treasuries, too. In other words, they’ve ratcheted up their efforts to reduce their exposure to American fiat currency while simultaneously continuing their relentless accumulation of real money. The reason Russia’s sale of US dollar-denominated bonds is suddenly front-page financial news is because of their extreme action in April, the most recent month reported. Their central bank dumped $47 billion-worth of US securities (bonds, notes, and bills). Russia sold half of their total Treasury holdings in one month! This most recent liquidation conforms to a larger trend initiated by the Russian central bank seven years ago. Since 2011, Treasury holdings have been slashed by over two-thirds, from over $150 billion to less than $50 billion. It’s clear that Russia wants to get rid of US Treasury securities. Turkey: The central bank has also sold nearly half of its US Treasury holdings since November. It held almost $62 billion five months ago and now holds only $38.2 billion (as of April). Don’t forget that Turkey has also begun to repatriate its gold from the US. Norway: The country has reduced its share of US debt by a whopping 40% since last September. It held $64.1 billion seven months ago, and as of April only holds $39.3 billion. Japan: The second largest holder of US Treasury holdings, the country cut holdings by $12.3 billion in April, to $1.03 trillion. China: The largest owner of US Treasury holdings, it also sold $5.8 billion-worth in April, to $1.18 trillion. Ireland, the UK, and Switzerland: All these countries also sold US debt in April. And whether you agree or disagree with the trade tariffs, they are likely to incentivize countries currently selling Treasuries to continue doing so, and entice other countries to join them. Why does this matter? After all, other than Russia’s actions, the declines have been relatively small so far. First, since the Federal Reserve stopped buying bonds in October 2016, foreigners have had to pick up the slack. And that “slack” is massive, peaking at over $4.2 trillion in October 2016. Further, the budget deficit keeps chugging higher, and is expected to surpass $1 trillion in 2020, according to ever-conservative and almost-always-wrong Congressional Budget Office. In fact, as I pointed out in my Vancouver presentation, the US government has been issuing record-level debt, already at $443.7 billion for 2018, an almost nine-fold increase from the same period a year ago! And since the budget deficit is automatically added to the debt, the rate of debt-level increase won’t slow down anytime soon. Second, since interest rates are rising, payments on our already-incurred debt get more expensive. Through the first eight months of the current fiscal year, the US has paid $319.3 billion in interest on its debt. That bill will continue to march higher as rates push higher, making it more and more difficult to service. And where does all this potentially lead? If the international community’s Treasury-selling trend continues or picks up steam, several things would (and several others could) happen. Interest rates would rise. They’d have to, not only to reassure existing bond holders but entice new buyers. We could even argue the Fed is raising rates in response to the softening demand for treasuries. They say it’s because of a healthy economy, but anyone selling their own debt “talks their book” — in other words, stresses how strong their underlying business or economy (and thus their eventual ability to repay the debt they’re issuing) is — even when that’s not true. They know demand is softening. Further, here’s something most mainstream investors don’t realize: the Fed may set interest rates, but in the long-term the market ultimately controls them. Think about it: if the debt you hold is not keeping up with inflation, for example, or if that debt is actually in jeopardy of being defaulted on, you’ll demand a higher rate. This has happened many times throughout history, not just in the US but globally. The Fed would be forced to respond to those demands — and you and I would pay more in interest on virtually any new loan (or any existing non-fixed-rate loan). In my opinion, there is a relatively high risk of this scenario taking place. The US dollar would fall, and inflation would rise. Bonds would get hit by the double whammy of being subjected to higher rates and also being denominated in a rapidly eroding currency. The perceived safety of bonds would deteriorate (and add to the appeal of gold). In worse case scenarios, the US could default on an interest payment, or return to money printing to make the payment. The latter would almost certainly be pursued before the former, ultimately sending the message to everyone around the world that the dollar is on its way to toilet paper. We don’t want this to happen, but Mike believes some version of it will. Russia’s dumping of Treasuries may be a retaliatory measure to counter US sanctions. It may be driven by financial need. It may even be a carefully orchestrated dress rehearsal with China so they could see how US markets would react to a significant short-term sale of Treasuries. But the motivation doesn’t really matter; regardless, the effects are the same. This trend, if it plays out, leads nowhere fun. We don’t know what Russia (and others) did in May, nor what they’re doing this month, but all investors would be well-advised to keep a close eye on this developing situation. 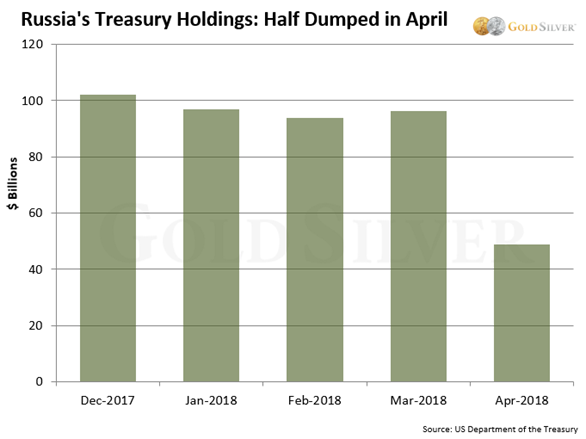 At the same time Russia is dumping Treasuries, they also continue to buy lots and lots of gold. Their central bank added another 600,000 ounces (18.66 tonnes) to its reserves in May. It now owns a whopping 62 million ounces! At its current gold-buying pace, Russia will surpass 2,000 tonnes by September. And within two years it would be within spitting distance of usurping France, currently the world’s fourth-largest sovereign holder of gold. 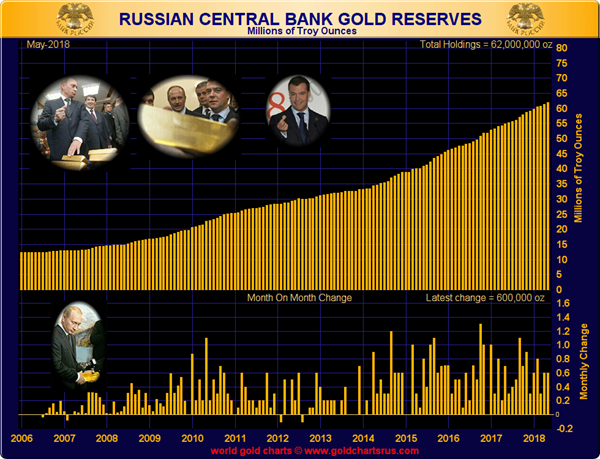 There is no doubt that Russia believes in denominating a large portion of its reserves in gold while also reducing its holdings of dollar-denominated assets, along with other countries. If this combination of actions proliferates on the international stage and leads to any of the factors above, the gold price stands to be a primary beneficiary.